Extant data mining is based on data-driven methodologies. It either views data mining as an autonomous data-driven, trial-and-error process or only analyzes business issues in an isolated, case-by-case manner. As a result, very often the knowledge discovered generally is not interesting to real business needs. 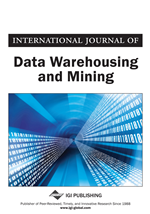 Therefore, this article proposes a practical data mining methodology referred to as domain-driven data mining, which targets actionable knowledge discovery in a constrained environment for satisfying user preference. The domain-driven data mining consists of a DDID-PD framework that considers key components such as constraint-based context, integrating domain knowledge, human-machine cooperation, in-depth mining, actionability enhancement, and iterative refinement process. We also illustrate some examples in mining actionable correlations in Australian Stock Exchange, which show that domain-driven data mining has potential to improve further the actionability of patterns for practical use by industry and business.